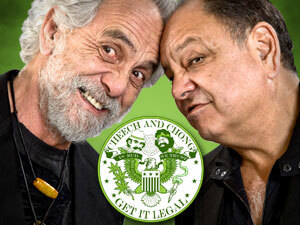 Read this article about marijuana activist/Cheech Marin's college roommate, Steve Kubby. Steve is currently serving time for a 2000 drug conviction. He is also dying of adrenal cancer, but the prison refuses to give him medicinal marijuana. Thanks to Bobby Capps for the link. Opening today at the Saint Louis Science Center - St. Louis, Chicano Visions: American Painters on the Verge is a traditional art exhibition presenting the works of a wide range of the country's Chicano and Chicana artists. Veteran artist, curator and facilitator René Yañez fronts the unparalleled exhibition, which is predominately comprised of pieces from actor/entertainer Cheech Marin's private collection. Featuring the work of 26 artists, Chicano Visions is one of the most powerful Chicano art exhibitions to travel nationwide. After the show closes on May 14, it will head to San Francisco; Fort Lauderdale, Fla., Los Angeles, Japan and Spain. On February 1st, Cheech Marin is hosting a hurricane Katrina benefit at the Cerritos Center in Cerritos, California. Here's the line-up: Don Felder, Stephen Stills, Alice Cooper, members of Green Day, members of No Doubt, Dennis Quaid, D.L. Hughley, David Foster, Gilby Clarke, Tommy Shaw. Tickets are $50 to $200 and proceeds will go to the Salvation Army and Red Cross Katrina relief funds. For more information, call (800) 300-4345. In November, we wrote about Sebastian, a German Cheech and Chong fan, getting a Cheech tattoo on his leg. Well, he just notified us that he received a matching Chong tatt on his other leg. His tattoo artist, Olaf from the Tattoo-Family Eisenhauer in Aerzen/Hameln, did a fantastic job. Cheech Marin will be one of the hosts of a hurricane Katrina benefit taking place February 1st at the Cerritos Center in Cerritos, California. Tickets go onsale Wednesday, January 18th at 10AM. We've drastically reduced the price of most of our DVDs. Now is the perfect time to complete your collection. Check out the new prices. After a successful run on Broadway in New York, Latinologues will play MIAMI's Byron Carlyle Theatre at the popular South Beach Comedy Festival Jan 19, 20, 21. Latinologues is the award- winning comedy about Life in America created and written by Rick Najera, one of America's leading comedy writers with "MAD TV" and "In Living Color" among his credits. The legendary comedy veteran Cheech Marin directs. Najera performs in Latinologues along with Eugenio Derbez and Shirley A. Rumierk, as they take on everything from beauty pageants to immigration, shattering Latino stereotypes with hilarious results. A special guest will be announced soon. a/k/a Tommy Chong, the documentary about Tommy's wrongful persecution, premieres this Friday at the Palm Springs International Film Festival. The director, Josh Gilbert, conducted and included numerous interviews with people from Tommy's past and present. The most interesting mention in this The Desert Sun article..."he admittedly indulged over the recent holidays in Canada, where pot is not exactly legal but in the realm of "decriminalized," Chong said he's going to abstain for the foreseeable future." Welcome back, Tommy! Long live Tommy Chong.